The Toyota Tundra is a full-size pickup offering realistic work capability and durability. It offers three engines, three cabs, three bed sizes and five trim levels in most popular configurations. We've found the Tundra to be a stable, comfortable truck for towing a 20-foot enclosed car trailer over long distances. Towing capacities top 10,000 pounds on some models, and maximum payload ratings exceed 2,000 pounds. For 2014, there is a new Tundra in terms of appearance. Most of the body panels are new, and to our eyes better looking. The dashboard, electronics and cabin trimming are new and also look better than before. Rear seats in four-door models are more comfortable and allow more in-cab storage. A rearview camera is standard on every 2014 Tundra. The engine, suspension and everything underneath are essentially the same with only small calibration changes most owners won't notice. The 2014 Toyota Tundra lineup is simpler than before. The two-door Regular Cab only comes in entry-level trim levels and only with a long bed. The Double Cab with conventional front-hinged, secondary rear side doors seats five or six and comes with 6.5- or 8-foot beds. The big CrewMax has four full-size doors, most seat five, and comes with a 5.5-foot bed and vertically sliding rear window that completely disappears. 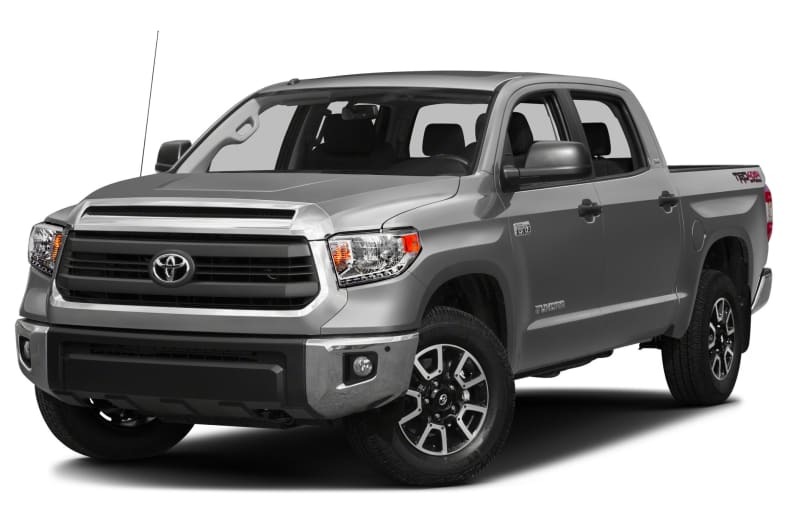 The 2014 Tundra lineup also introduces the 1794 Edition, the new top of the range that appeals to buyers who would like to be on the range. Named for the ranch on which the Tundra factory sits, the 1794 has requisite big badges, cowboy-color leather and ultrasuede interior, woodgrain trim, and things like ventilated power seats and big JBL sound system to improve the ride after a long day's work. Other Tundra models offer more towing capability, but even a Tundra 1794 loaded with five cowboys can tow more than four tons. Updated infotainment systems for 2014 all use Toyota's Entune name. Even the least expensive Tundra has a touchscreen, CD player, iPod integration and Bluetooth, and the higher the trim the more features get added: SiriusXM satellite radio, HD radio, subscription-free weather and traffic (where HD radio is supported in urban areas, through your smartphone cellular data outside those regions), GraceNote art, expanded voiced recognition including compound commands, navigation, predictive traffic, radio buffer that lets you pause up to 20 minutes of AM/FM/HD radio for later playback, Entune App Suite (Bing, Pandora, Open Table, Facebook Places, Yelp and more) and a 440-watt JBL sound system.